On a recent evening at the W1YU Club at Yale, we had a program on QRP operation. That got me thinking. What equipment do I have for QRP work? Well, I have an Elecraft XG-2. It puts out a fairly well calibrated 50 μVolts into 50 ohms. That is about 50 picoWatts on 20, 40, or 80 meters. So here is my QRP transmitter. All it needs is a CR-2032 battery. 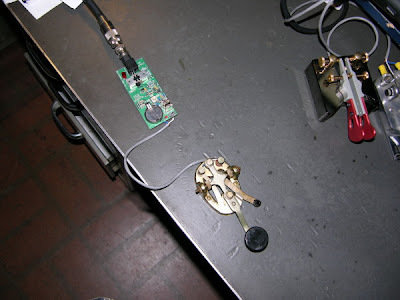 I find it is tricky to send CW with the power switch, so I attached an old straight key. The coax goes to a 3-element SteppIR at 40 ft.
What can we do with 50 pW on 20 meters? First, try listening for it on my main rig, the Orion using a 40 M dipole. There it is, about S2 on 14.060 MHz. It is stronger if I aim the beam south, toward the dipole. I tried a quick "CQ" just in case... But the band was dead. No response, no surprise! Next I tried using my Icom R8500 set up temporarily in the car, with a 15 foot wire strung out over the trunk. The '8500 is not a great CW rig - it doesn't even have the narrow filter, but otherwise it fills the bill. First test: yes I can hear the signal in my driveway, about 60 ft from the beam. I drove away to a point about 300 M away and gave a listen. (Auto noise was hopeless - I had to shut off the Acura completely before I could get near the noise floor.) Nothing at 300 M. Drove closer and closer, but still nothing positive. Finally, the signal was there at S1 about 2 houses away from mine -- maybe 50 M. It would have been usable for a QRS CW QSO. OK - if 50 meters is the range for 50 pW, what can we calculate? How about if we had 50 microwatts instead? That's a million times more power, and the square root of a million is 1,000. (We assume the inverse square law works, although really we're in the near field at only 50 M separation.) So what range would we expect for 50 μW? A thousand times more -- 50 kM or about 30 miles, at least for free space line of sight. One day, I may throw together a 50 μW "QRO" rig to check this prediction. Another calculation: 50 M is 28.6 milli-miles, so we have 571 million miles per Watt. It wasn't a two-way QSO, but would this be a record?